Congenital diaphragmatic hernia (CDH) occurs in 1:2000-3000 live births a year. Mortality rates range from 40-60% and is one of the most costly neonatal conditions. We report an analysis of the clinical outcomes at a high volume tertiary pediatric hospital from 2002-2007. A review of 102 patients was done from January 1, 2002 to December 31, 2007. Outcomes were compared to an international database maintained by the CDH Study Group (CDHSG) of 2109 patients. Demographics, birth weight, gestational age, 5 minute APGAR, male: female ratio at our institution closely paralleled the CDHSG database. Prenatal diagnosis occurred more frequently compared to the CDHSG (68% vs. 61%). 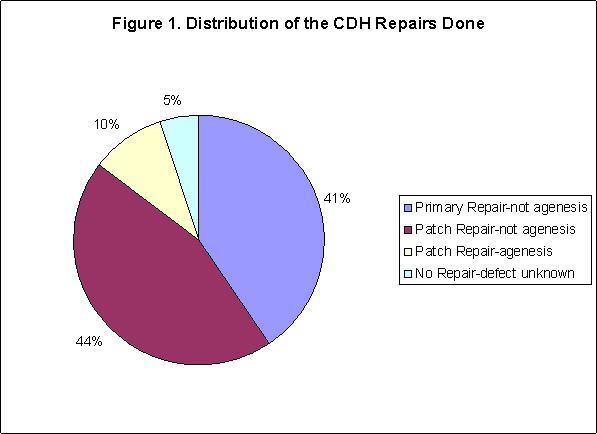 95% of patients underwent repair (Figure 1) vs. 83% in the CDHSG. 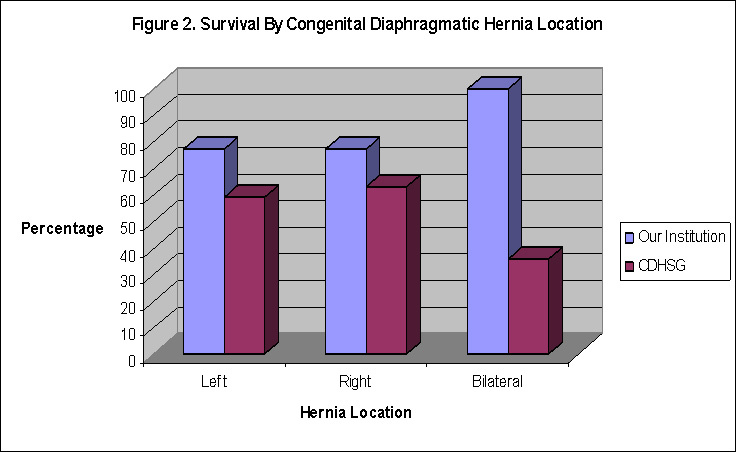 We had improved survival despite the location of the hernia (Figure 2). ECMO was required in a third of infants with CDH with a 56% survival rate, compared to a quarter in the CDHSG cohort and 54% survival. Overall survival of isolated CDH was 83% and with associated anomalies 77%, compared to 73% and 69% respectively in the CDHSG. Nearly half of our patients were on room air at 30 days of life and 71% were on room air by discharge.